So true. There is a chance Star Wars doesn't over take it. I have zero interest in the Avatar universe Cameron plans to build. 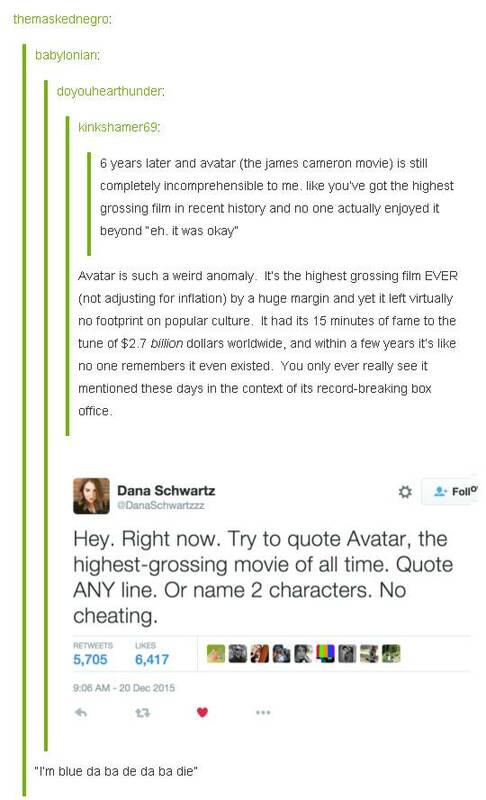 Are there still plans for sequels to Avatar? wags83 wrote: Are there still plans for sequels to Avatar? Delayed to 2017, but I heard they want to do multiple films. I bet a majority of people can't quote a single line or name the 2 leads. Got arrested for being drunk or for a different reason? Were you making a huge scene? Tyler wrote: Got arrested for being drunk or for a different reason? Were you making a huge scene? I believe it's Sam Worthington, right? wags83 wrote: I believe it's Sam Worthington, right? I'm pretty sure his character's name is Jake Sully. He plays a disabled space marine who uses his dead brother's avatar to become the very best like no one ever was. Also has JP from Grandma's Boy, Sigourney Weaver and Michael Ironside? Other than remembering it looked fantastic in 3D and the basic plot. I don't know any lines of dialogue. Also I think Michelle Rodriguez is in it. Right on all accounts except Michael Ironside. Last edited by DannyFanny on Tue Jan 19, 2016 4:07 pm, edited 1 time in total. I remember the movie's plot and the actors. I don't remember their names and couldn't really quote any dialogue. I don't think it's a bad movie by any means and I remember I really enjoyed it when I saw it in theaters but it's not one of my favorites. It was the first real 3D movie so people went gangbusters for it. That won't be repeated for any sequel. Will anyone care enough to see these? I'm sure I'll watch them at some point. Not sure if it will be in theaters. When the first Avatar came out, the rumor was that the sequels would be similar concepts but on other worlds, which I thought would be neat. This sounds kind of boring. They're really getting ahead of themselves.